Are you looking for a great new e-book read? My new -book titled: The Death of Phar Lap. The Unsolved Never Ending Mystery. is available at www.amazon.com or www.amazon.ca and in many other countries through Amazon stores. It is the true story of Phar Lap, the ugly duckling champion racehorse who brought smiles to faces and hope to hearts during the Great Depression. Then, sadly and suddenly he died under very mysterious circumstances in 1932. 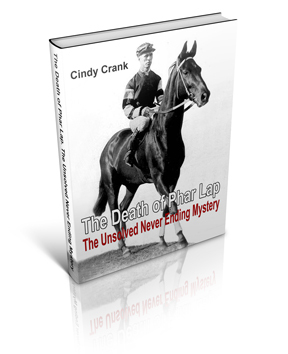 The book details his life, his meteoric ride through the ranks on the race tracks and explores the theories surrounding his death with a sudden twist at the end that will shock. Tags: Cindy Crank, Phar Lap, The Death of Phar Lap. The Unsolved Never Ending Mystery.